In the mood for indian food? | Hello World! 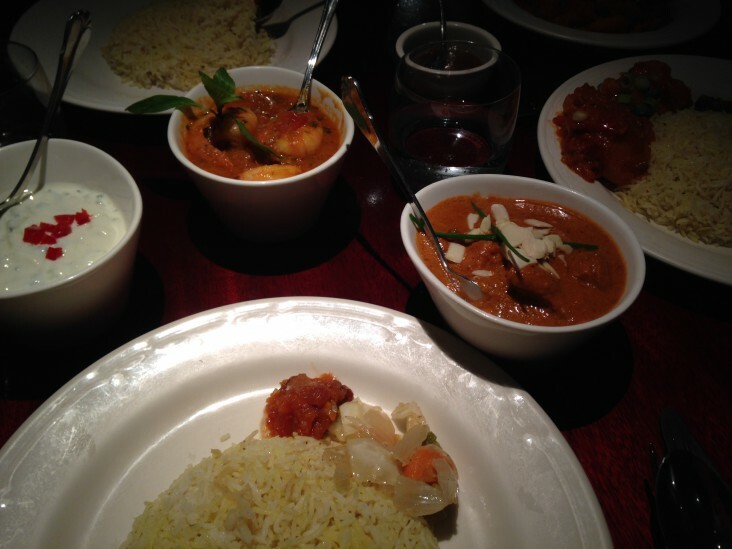 In the mood for indian food? I recall a time of my life when I was addicted to Bollywood films and had a poster of Shahrukh Khan (also known as the Indian Tom Cruise) on my wall… YES, I confess I enjoy this kind of movies because they are romantic and lively, full of happy people dancing and singing and it is nearly as long as a cricket match 😉 …but what I enjoy more is Indian cuisine and its beautiful colours! As you know I am always keen on trying new restaurants! So a couple of days ago, I went to a place called Jasmin in Adelaide CBD and I spent a lovely time there I must say. This award winning restaurant is pretty popular and well located on the corner of Grenfell and Pultney street. The atmosphere is warm and cosy… very intimate! The night I ate in this restaurant there was a couple in a corner holding hands and having a romantic dinner… I bet they were celebrating an anniversary! As for me, I was in good company and we all had a delightful evening. Each dish was flavory and so appealing with beautiful colours. I particularly enjoyed their “feed me” menu where they prepare a wonderful selection for you based on your tastes… I am terrible at making decisions with food since everything looks amazing so for me it is the perfect option! Furthermore I like to be surprised and discover new flavours! So they kept bringing a variety of mouthwatering dishes and I felt bad I could not finish all these delicious plates but it was a lot of food! It was also the opportunity to taste new things that I would probably not have picked myself like the Tandoori mushroom! What a beautiful discovery! Basically it is a large thick and tender mushroom marinated in spices and it tastes absolutely marvelous! Definitely a must try! I ‘ve already been there my friend . I agree with you actually I ‘ve ever ate so wonderful food until I arrived at Adelaide . I mean not only indian but also chinese japanese corean indonesian . I used to going to some restaurants at my country from these countries but here I ‘ve tasted the best food you know dishes are too much westernaised there …and you do not get the real flauvour as much as here …thank you for your post! I completely agree with you Balbina 🙂 I feel so lucky to live in Adelaide and have access to all these beautiful restaurants! Like you said, the flavours here are amazing, probably due to the fact that Australia is closed to all these wonderful countries so we can enjoy really typical food! I think they had a huge traditional difference in food which makes them special. Is it? Dear Abid, I really recommend you this place, it is very nice, they have a wide range of food and they are specialized in North India cuisine… try the Tandoori mushroom, it is DIVINE!